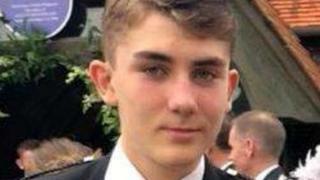 A body found in woods was that of missing Aberdeen teenager Liam Smith, police have said. The 16-year-old was last seen on 17 November on a bus. A major search was launched in the Aberdeenshire countryside, but a member of the public discovered a body on Friday. It has now been confirmed the body was that of the teenager. His mother Alix, thanking everyone who searched, said in a statement: "Our hearts are broken." She said: "While we never gave up hope of finding Liam, we were realistic about the challenges facing us. Liam's body was found in remote woodland south of Banchory. There were not believed to be any suspicious circumstances.